To write this guide, I went through all of my purchases this year and I’m sharing my favorites. This was kind of dangerous to do because I always find new things to buy while I’m on Etsy! I started spinning this year, and I discovered the wide range of talented fiber artists who dye and prepare fibers for spinning. I love buying roving and combed top. I might have gone a little overboard with it when I first began spinning. When I started spinning, the first seller I bought fiber from was Living Dreams. I love this blue and green Merino and tencel blend, though they don’t seem to have it in their shop anymore. On the left, I’ve pre-drafted it into small bundles for easy spinning. I also like their pencil roving, which is great for beginners because it requires a lot less effort draft. I used this green BFL assortment for a fractal spun yarn, which I knit into a hat. And I used their purple Merino and tencel mix for experimenting with fiber blending on a hackle and blending board (see my post on an easy DIY blending board). Etsy seller Wildthyme has some of the most beautiful batts and rolags I’ve ever seen. I had to buy more of this blue and green art batt because I loved it so much. I think this might be my favorite yarn so far! Quillin Fiber Arts has the softest fibers I’ve felt! I bought this lovely silk and BFL mix from her, which has a wonderful silky sheen when you spin it up. And I got this Merino, yak, and silk blend, which I just started spinning. I like it so much, I already bought more! Jakira Farms has some of my favorite colorways and blends I’ve spun so far. I bought a couple of Merino and black tencel blends, as well as a BFL dyed and natural black blend. The streaks of black in each braid made interesting stripes and contrasts in my yarn. They don’t have the exact colorways I bought anymore, but they do have similar ones. I bought a beautiful alpaca braid from Created by Elsie B. She has many lovely colorways in her shop, and also a fiber of the month club, which I’m considering joining. Who doesn’t love to get new fibers in the mail each month? Robin J Edmundson has some beautiful fibers as well. I bought a Merino and tencel braid from her, as well as some smaller bundles of tencel and cotton fibers. I like that she sells smaller amounts of fibers. I bought 1 oz of a few different colorways of tencel and cotton. I ended up adding the tencel into a few projects on my blending board, and it looked great! I might try spinning it by itself sometime, too. I also wanted to try spinning cotton without buying a huge amount, but I haven’t gotten around to that just yet. I love the colorways I got from Wool Gatherings, especially this alpaca and silk mix. I wish I’d bought more! They don’t seem to have any more at the moment, but I’ll be checking back for it. I also got some Merino that spun up quite beautifully, and I made it into a cowl. If you or whomever you’re buying for would like to start spinning, but you don’t want to invest in a wheel just yet, try these 3D printed spindles from Turtle Made. I got a Turkish Spindle, which I like because you’re left with a center pull ball once you’ve wound it onto your base. I’m going to put this under spinning, but they’ve got some tools for weaving as well. I find myself buying a lot of stuff from The Knit Store. They have good prices, their items are all made in the US, and their quality is high. After doing a lot of research, I bought a ball winder and yarn swift from them. There are plastic ball winders you can buy that are cheaper, but, from the reviews I’ve seen, the quality is not great, they break easily, and there’s no way to fix them. This yarn winder costs a little more, but it’s really sturdy and well-made. Plus, they sell extra parts for it and it can be completely disassembled and rebuilt if necessary. I think it’s worth buying a better quality one that will last a long time. And with the yarn swift, you can find cheaper ones, but they’re likely to break or function poorly, especially umbrella swifts. The Knit Store does have a combo with the jumbo ball winder and large yarn swift, but when I got them, the shipping was cheaper when I bought them separately. I also bought a niddy noddy from them to help turn my yarn into skeins. After looking around online, this was one of the more reasonably priced niddy noddies that I could find. Last year, I posted about getting a Schacht Flip Loom which I absolutely love. I bought my loom from The Spinnery on Etsy. The shop owner was helpful and informative when I had questions, and everything shipped quickly and was packaged very securely. When you buy a loom, you'll also get a coupon for $15-25 off anything in The Spinnery's Etsy Shop. You may also want to use that coupon to get extra heddles for the Schacht Flip Loom or check out looms and weaving accessories from The Spinnery. In the project below, I’m using some of my handspun yarn. 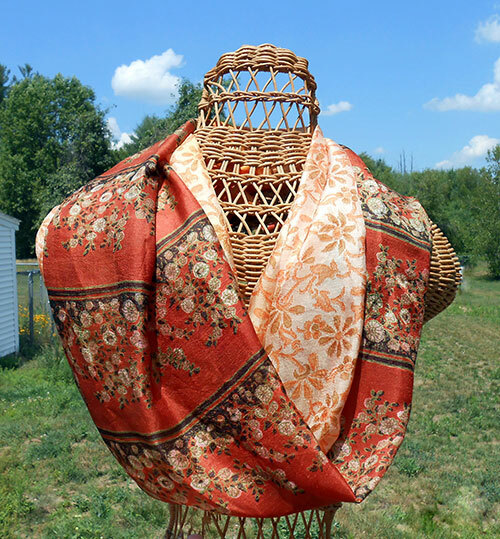 I got a Leclerc Artisat floor loom earlier this year, and I bought a wonderful scarf kit from Carr Park Artisans to make as one of my first projects. I was kind of intimidated by all of the planning you need to do to make sure you have enough yarn and that your project turns out well. I figured I’d let someone else do the hard work! The kit came with a pattern, instructions for weaving, a pre-wound warp, the weft on a bobbin, and some extra yarn just in case you run into problems. And when I had questions, the seller was helpful and patient with me. See all of her weaving kits here. I then bought this fringe twister from The Knit Store because it was the most economical option, and I wanted to finish up the fringe on my scarf. Handy Woman also has a lot of cool handmade weaving tools that are quite affordable. I bought a raddle from her, and it was the most reasonably-priced one that I found, and it seems to be sturdy and well-made. It even came with a quilted bag for storage! See her selection of raddles here. And I also got a narrow pencil shuttle to help me weave as much of the warp as I can to reduce loom waste. I hope this guide has helped you to come up with some good gift ideas for the fiber arts person on your shopping list!